Just as the Russian pattern developed from the older Star and Hobnail pattern, so did the Persian pattern result from an elaboration of the Russian pattern. It was never patented, although it was used as a major motif in one patented design — Hunt’s Royal Pattern of 1911. This, however, was a late application; the pattern was in use by 1885. Its heyday seems to have been the years around 1890. Identification of the pattern is not difficult. Nevertheless, erroneous statements by a number of authors and poor photography have combined to create difficulties for dealer and collectors alike during the past fifty years. It is hoped that the diagrams in this file, together with correct identifications of Russian-Persian and Persian patterns that were originally incorrectly identified in the literature, will help resolve these difficulties. Contrary to what has been written — beginning with Dorothy Daniel in 1950 — the Persian pattern is not defined by a tiny hobstar cut on the pattern’s hobnail. This motif may be present, and usually is, but it is also possible for the hobnail to carry another motif, such as the Brunswick star or strawberry (fine) diamonds, or even be left uncut, although the latter version is rarely seen. As in the case of the Russian pattern, the Persian pattern is defined by six intersecting sets of parallel miter cuts. But in the Persian pattern, two additional intersecting sets of parallel miter cuts are also used. They are perpendicular to each other and are parallel to two of the original six sets. Therefore, the number of intersecting sets of parallel miter cuts remains at six. In the following series of diagrams focusing on the patterns’ hobnails, it was necessary to enlarge the images in order to show the Persian pattern’s multi-sided hobnail. The Russian pattern (left) morphs into the Persian pattern (right) Mention must also be made of the diagram in the middle because in the original version of this file it was presented as a diagram of the Persian pattern. Wrong! The most one can say about it is that it represents a kind of Quasi-Persian pattern. It was erroneously believed by this writer that the Persian pattern used the octagonal hobnail that is shown on this diagram, with sets of three straight miter cuts meeting at alternate vertices (for a total of four triple-points). That the three miter cuts did not always meet exactly at a point was thought to be the result of inaccuracies that could be expected in the real world when cutting in such very small areas. One can find instances where this is the case. But in the vast majority of examples, the three miter cuts do not meet at a triple-point, and, in fact, they must not do so, otherwise no 12-sided hobnail would be produced. This dodecagonal hobnail is the defining motif of the Persian pattern; how the hobnail is decorated is irrelevant (note 1)). The labeled angles (a, b, c — and their three supplementary angles) are identical in the three patterns. It can also be seen that the octagonal “box” that surrounds the pyramidal star in the Russian pattern — one quarter of which is shown — is transformed into a square and reduced in size when the additional miter cuts are made. This characteristic is helpful in identifying the Persian pattern. It is far easier to see the square than it is to count the 12 facets of the dodecagonal hobnail. In fact, the latter task is often impossible, especially when photographs are used. The diagrams also show that the amount of “adjustment” necessary to convert an octagonal hobnail in the Quasi-Persian pattern to the dodecagonal hobnail in the true Persian pattern is very small. It is calculated, in note 2, to be 3.4% of the polygon’s circumradius (the distance from the center of the polygram, or circumscribing circle, to one of the polygon’s vertices). The foregoing explanation is straight forward, but Dorothy Daniel (1950) was unaware of it. Consequently, she inadvertently introduced an error that has caused considerable difficulty, in part because it has been repeated by a succession of writers. She considered the Persian pattern to be a variation of the Russian pattern, in that it “changes the simple [i.e., single] star motif to a many-pointed hob-star figure.” This is a description of the Russian-Persian variation, not the Persian pattern where — as we have seen — additional miter cuts are necessary. Ironically, Daniel does show the Persian pattern, with clean, 12-sided hobnails on p. 32 (top). She describes it as having been “cut in [a] variation of the Russian pattern” with no mention of the word Persian, which she reserves for what is now called the Russian-Persian variation (p. 188). The Pearsons also ran afoul of the Persian pattern, and in a similar way, describing the pattern as being “cut with a many pointed hobstar” with no mention of the additional miter cuts (Pearson 1965, p. 37). In fact, when the Pearsons do display the Persian motif — as part of Harry S. Hunt’s patented Royal pattern (shown here) — they comment that it “looks like the Russian pattern but a closer examination shows the hobstar button with 12 facets around it.” They then proceed to make matters worse by adding “instead of the usual six or eight” facets. Eight facets? Yes, for the Russian pattern, but six facets? Never! The Persian pattern is shown in the Pearson’s book (p. 180, top left), but the pattern is described as Russian. Both Corning companies — Hoare and Hawkes — seem to have always cut a hobstar on the pattern’s hobnail along with, of course, the additional miter cuts. But Hunt seems to have used a Brunswick star in place of his neighbors’ use of the hobstar, based on numerous examples seen. 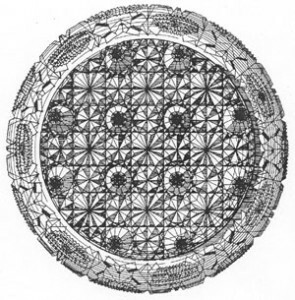 The hobnail’s decoration is difficult to see in the patent’s drawing (above), and it is not described in the patent’s specification. Pearson refers to “the hobstar button,” but, in practice, he does not distinguish between the hobstar and the Brunswick-star motifs; therefore, his reference may be to a Brunswick star “button.” At any rate, it is ambiguous. Hunt’s Royal pattern would appear to show great accuracy-in-cutting. However, this may be due entirely to the fact that the company made considerable use of “figured” blanks, where all of the major miter cuts are pre-formed in molds. The writer has yet to see the Royal pattern cut on a plain (i.e., non-figured) blank. The diagram at the head of this file shows the Persian pattern as cut by Hoare. (It is readily compared to the Russian pattern shown in the Russian2.html file.) 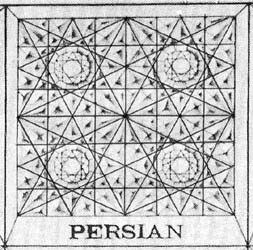 It is this drawing that provides the evidence needed to define correctly the Persian pattern. 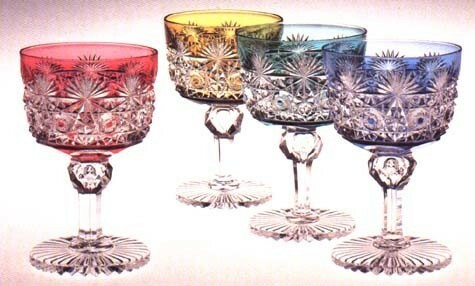 It was first published, together with other patterns, in Sinclaire and Spillman’s book on the Corning cut-glass industry (1977, first edition, p. 33) but in a small format of limited usefulness. A larger version was published in the ACGA’s 1992 composite catalog for J. Hoare & Company. These “antique” drawings, enlarged further, and with miter cuts darkened to increase clarity, can be found throughout this Web site (note 3). Apparently few companies cut the Persian pattern on a regular basis. Mt. Washington was one that did, however, calling the pattern Imperial. Like the Hoare and Hawkes examples that have been seen to date, this company also used hobstars on the hobnails. It was an expensive pattern. A price list from c1885 lists a 14″ (35.6 cm) L tray at $56, compared to $42 for pattern No. 60 (Russian Cleveland), and $30 for the Strawberry Diamond pattern in an “all over” cutting. In the following examples of the Persian pattern the pattern is restricted, and, therefore, there is no square “box” around the pyramidal star. However, the pattern’s additional horizontal and vertical miter cuts can be seen. From THE CORNING MUSEUM OF GLASS ANNUAL REPORT 1998, p. 27, where the pattern is incorrectly described as Russian. The glasses themselves are on permanent display at the Museum where they are correctly labelled. H (tallest) = 4.37″ (11.1 cm). Photographer: Nicholas L. Williams. Copyrighted; used with permission. This image may not be reproduced without the written permission of the Corning Museum of Glass. 1. Although one might assume that a hobnail with more than 12 sides is not practical, there exists at least one example with 16 sides, cut by Frank Wilson & Sons on a medium-size cologne bottle (Sinclaire and Spillman 1997, p. 167). 2. The very small distance that must be applied to the x- and y- intercepts of the additional miter cuts in the Quasi-Persian pattern in order to change the octagonal hobnail into a dodecagonal hobnail can be calculated from the following diagram, where this distance (d) is equal to the circumradius of the hobnail (R) less the hobnail’s median (r). 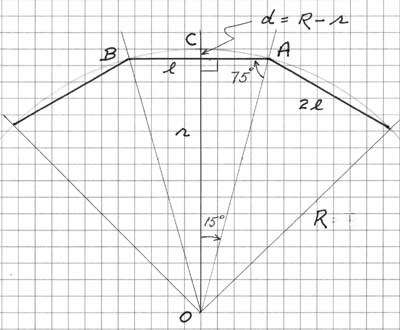 The angles of the right triangle produced by dropping a median from point O are 75 deg and 15 deg. The latter angle is one half of the angle subtended by one side of the hobnail, 30 deg (360 deg divided by 12). Because d = R – r and cos15deg = r/R, substitution yields d = 0.034R or 3.4% of R. In the diagram, where R equals 16 units, d = 0.54 units (as graphed). The length of one side of the dodecagon can similarly be calculated, but it is unnecessary when graphing the Persian pattern; only the value of the “adjustment” distance (d) is needed. 3. There are 28 patterns illustrated in this early catalog, but Spillman’s list of them, in Sinclaire and Spillman 1997, p. 34 omits Oct. Hobnail, which is illustrated, and adds Chair Bot[tom] which is not. Chair Bottom is usually considered to be identical to Oct. Hobnail. In her 1996 book, Spillman adds to the list of patterns that are supposedly not illustrated, including Hobnail, Corona, Spider Web, Twin City, and Universal (p. 41). All five of these patterns are, in fact, illustrated. The Universal pattern, for example, can be seen in the Boggess 5 file in Part 4.